Award winning corporate health and wellbeing provider Let’s Get Healthy has delivered a bespoke workshop to empower colleagues to ‘Be the Best You Can Be’ at the leading global network of independent accounting and consulting firms, Nexia International. The interactive, high-paced workshop presented the latest evidence-based techniques to inspire colleagues to establish daily rituals to improve personal and team resilience. Let’s Get Healthy was recently named Gold Winner at the 2018 Employee Experience Awards in the category of Health & Wellbeing. 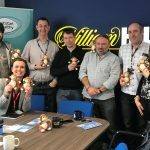 The Leeds-based company boasts diverse sector experience, and currently operates as corporate wellbeing providers to the likes of Co-op, G’s Fresh, William Hill and Northern. For more information on Let’s Get Healthy and how to embed health and wellbeing in business strategy please visit www.letsgethealthy.co.uk.